Camp David Negotiations Research Papers look at the peace process when Jimmy Carter and Anwar el-Sadat met at Camp David. This is a political science research paper on the Camp David Negotiations. A quality Camp David Negotiations term paper will provide an in-depth analysis of the entire event. Jimmy Carter's greatest accomplishment during his administration is most often considered to be his role in the Camp David Peace Accords between Egypt and Israel. These two countries had been at war with one another since Israel was established in 1948. In 1978, President Anwar el-Sadat of Egypt and Prime Minister Menachem Begin of Israel met with President Carter at the presidential retreat that is known as Camp David. 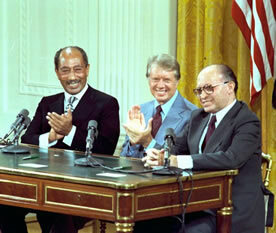 The Camp David Accords ended in a signed treaty among the countries of the United States, Egypt, and Israel. However, President Carter was called upon at the last minute to skillfully rewrite the letter that was to accompany the accords. He was able to do so in such a way that the document accurately reflected the agreements while preserving standards and requirements that would appeal to the citizens of Egypt, Israel, and the United States. In your introduction make a statement of the goal and the planning and preparation that took place at the meeting An objective description of the actual events that occurred; An analysis of those events; Integration of readings, theory, and concepts as appropriate. What were the Bearing Challenges? What occurred during the period Leading up to Camp David? Describe President Carter’s Negotiations and the Camp David Documents. Who were the major parties involved? • Briefly, what led to the meeting? • Who were the players involved and what took place (purpose)? Paper Masters writes custom research papers on Camp David Negotiations and look at the peace process when Jimmy Carter and Anwar el-Sadat met at Camp David.